When the average person thinks about public transit, their mind usually envisions the New York subway system or Chicago’s “L.” Transit services see the highest ridership and farebox in high density urban areas where the community demands a high level of service and there is a high portion of “choice” riders. These are the areas where high population, walkable urban development, and a community’s entrenched transportation culture easily sustains robust transit services: think the New York City subway, or the Metro in Washington D.C. No one is likely to complain about funding these reliable and established services because users demand the service and they have the resources to pay for it. Lower density suburban and rural areas need these transit services just as much, and should not be denied access to transportation because of lower farebox revenues. 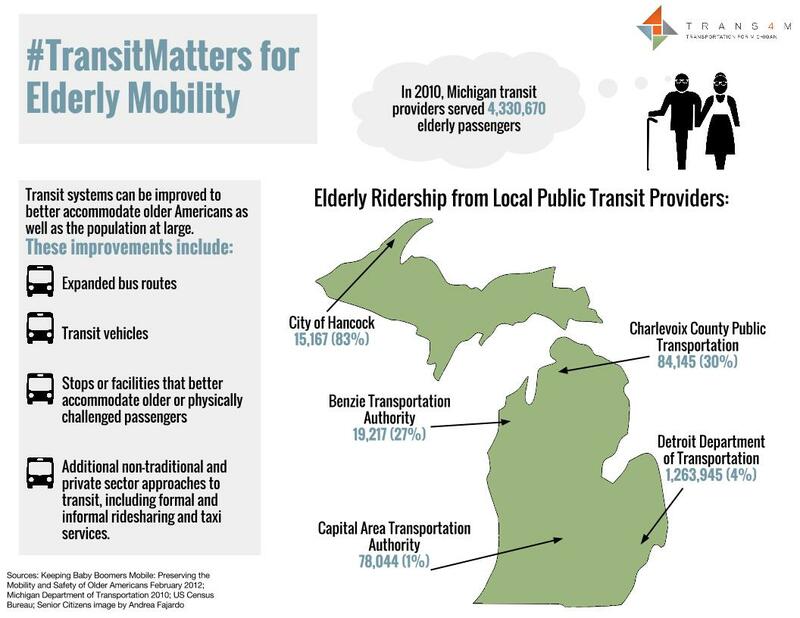 Certain segments of the population, including the elderly, individuals with disabilities, or those without access to a car, depend on transit services especially in these areas where travel to places like work, medical appointments or grocery stores are impossible without some kind of vehicle. Dial-a-ride Services in Midland help provide transit services to vital populations in lower density areas. Photo Courtesy of City of Midland. Urban residents heavily depend on transit to avoid the hassles of having a car in the city, including heavy traffic and premium parking fees. New York City’s 18.6 million residents each take 229.8 trips per year. The San Francisco Bay Area has a population of 3.4 million with 131.5 trips per capita, and Washington, D.C. has a population of 4.7 million with 99.6 trips per resident. University towns, with clusters of students, and walkable neighborhoods, demand and justify transit systems, often with the help of University funds. Those who argue against increased transit funding or service levels often think in abstract concepts of efficiency and performance measures. Analysis by the Institute of Transportation Studies at the University of California Berkeley found that increasing urban densities will place public transit on firmer financial footing. These statistics do not concern themselves with the individuals who need to use the transit and why they need the service. Individual experiences and needs offer a full picture of equity in public transportation that helps to fully justify services outside of these densities. The recent media buzz surrounding James Robertson, the Detroit man who walked 21 miles to work in Rochester Hills everyday, associated a face with the poor condition of public transit services in metro Detroit. Compassionate individuals offered help to Robertson, what about others like him who need to reach important employment opportunities? Affordable and accessible transportation infrastructure in the suburbs can help the increasing number living below the poverty line in these areas. The Atlantic cites that the number of suburban poor surpassed the number of poor in the cities in the 2000s and by 2011, almost 16.4 million in the suburbs lived below the poverty line. The sprawling suburban landscape creates a heavy disadvantage for those without a car, especially those who need to travel to find or hold employment (like Robertson). Dial-a-ride services are an important alternative in these lower density areas. Although high costs are a deterrent to extensive usage, those with disabilities, veterans, or the elderly receive reduced rates. High rates will also keep low income residents from using the service. A recent Pacific-Standard article mentions that while programs exist to help low income individuals or families buy groceries, pay rent, or get access to healthcare, there are no programs that help pay gas, train, or bus fare. A car may provide mobility for one person, but transit creates access to opportunity for all residents. In Michigan, all 83 counties have some form of public transit.. Transit provides vital benefits in low density suburban and rural areas. Even though fares will never (nor do they anywhere in the world) fully cover the operational costs, these services provide lifelines to the elderly, those with physical or mental disabilities, and those who just can’t afford to own a personal vehicle.